In this Mira Showers buying guide we take a look at all the available options from electric showers to digital, to help you choose the perfect shower for your home! Posted By Alan, 13th Jul 2017. 6 Minute Read. Buying a new shower is never as simple as it sounds. There are so many brands out there to choose from; and, even when you do finally find a brand you can trust, they then have a stack of models for you to decide on and it can feel like you're being showered with too many options. Buying Mira showers is no different. Whether you’re in need of an electric shower, power shower, digital shower or a mixer shower; Mira offer an incredible selection of models in a range of styles, all boasting a variety of great features and benefits. In this Mira showers buying guide we aim to quickly explain the varieties of showers available to help you choose the best Mira shower for your home. In order to keep this guide concise, we won’t be covering the kW ratings of electric showers although you can find out more about electric shower kW ratings here. Trusted by homeowners and those in the trade, Mira electric showers are renowned for their quality build and performance. All Mira showers come with easy fit options for replacing older electric showers, even from many of the other big brands, without fuss. Each range comes packed with useful features including safety features and luxury functions to improve your showering experience. Below you'll find out what each different Mira electric shower offers to help you pick one that ticks all the boxes. Take the leap and choose the Mira Jump electric shower if you’re looking for great performance on a smaller budget. 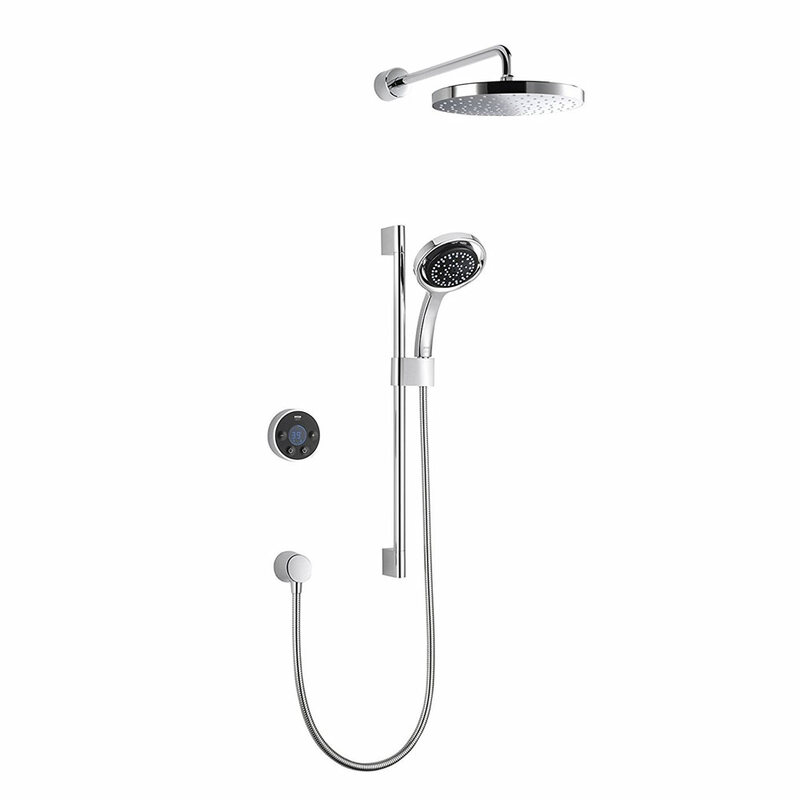 You’ll find all the popular features of Mira showers including the 4 spray shower head - which delivers a variety of spray patterns - as well as Clearscale technology to help keep your shower looking and performing better for longer. 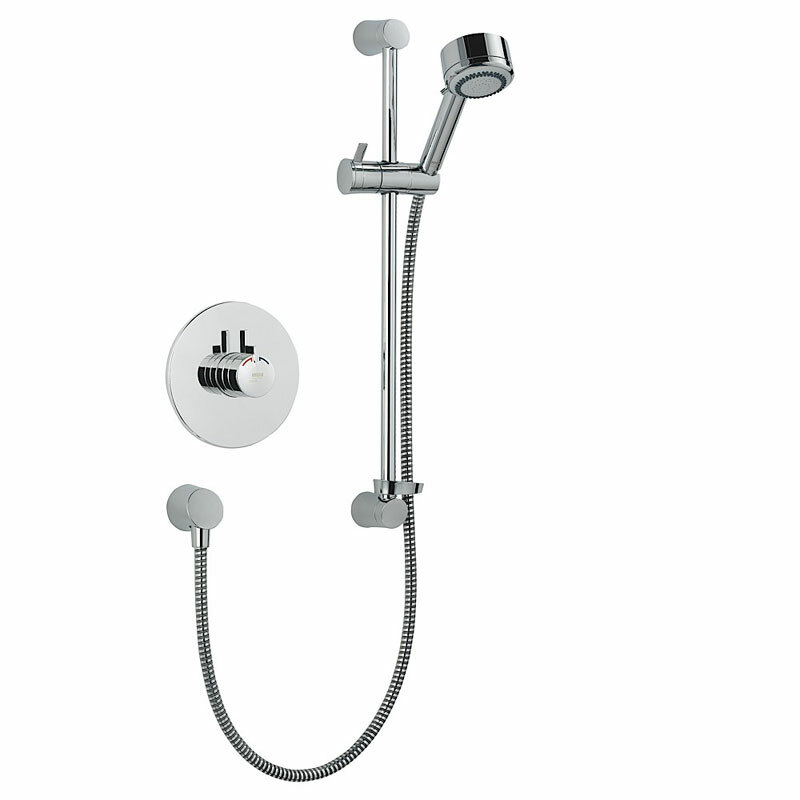 Mira Sport electric showers are quite possibly the most desirable in the whole range. Their popularity is fueled by their exceptional performance and price. 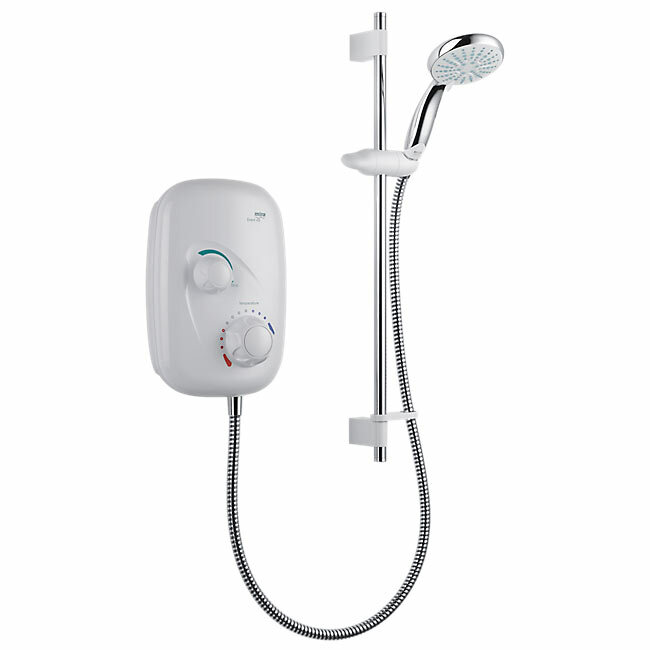 This mid-range electric shower from Mira is trusted by those in the trade and is packed with functionality at a price that is affordable to all. If you’re looking for contemporary style but would still like an electric shower that does it all then prepare yourself for the Mira Escape. Combining the latest technology with style that’s right on trend, Mira have have created an electric shower that will allow you to get away from it all and enjoy pure luxury. Don’t let the beauty of the Mira Azora fool you. It’s a powerful electric shower that is bursting with features to give you the best shower experience. Featuring a stunning frosted glass fascia, this Mira shower looks as good as it performs! It’s a higher value shower but it’s totally worth it! Although Mira showers do have lots of electric showers in the mid to high price range, they still offer plenty of fantastic options in the budget area. The Mira Vie electric shower range features all the necessary functions for a dazzling shower experience without the dazzling price tag - when it comes to competition for a budget electric shower, there is none! 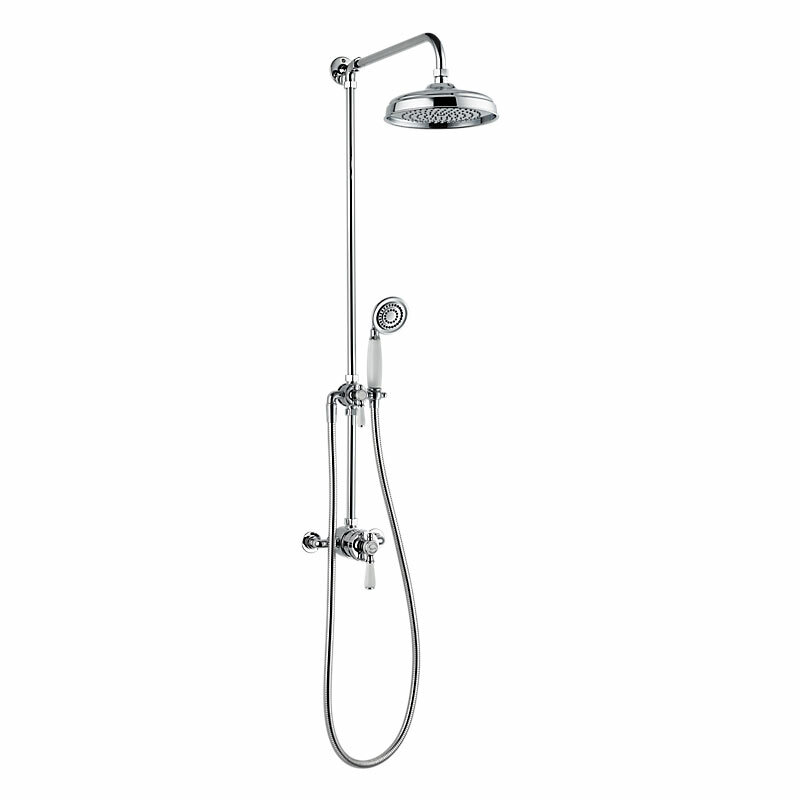 Lead the way in shower style with the Mira Galena electric shower range. This stunning electric shower fuses luxury with functionality; featuring everything you need for the perfect showering experience. When it comes to great minimalist design, Mira showers are experts in getting it right. Unlike electric showers, which use a heating element to heat up the water from a cold feed, power showers directly access hot water from the boiler. This means that they can produce a body drenching 16 litres of water per minute - perfect for a busy lifestyle. Mira power showers are built to high standards and are guaranteed to stand years of use. 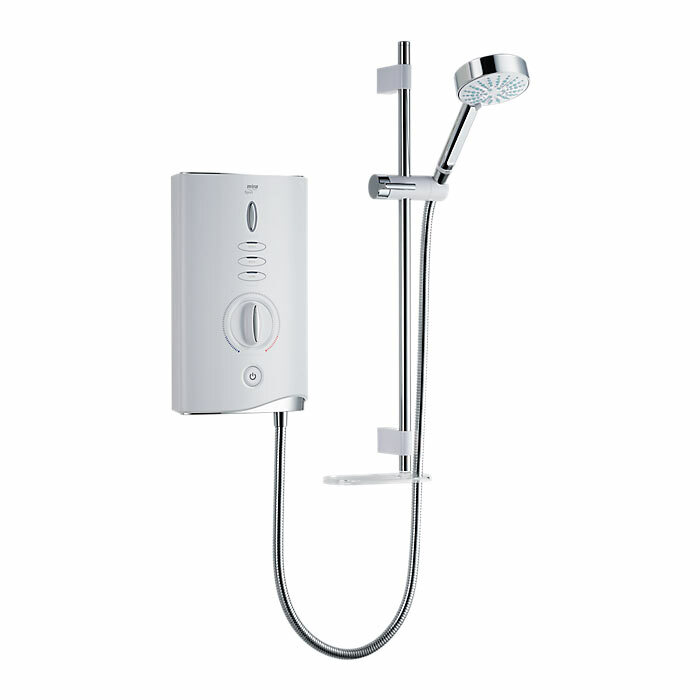 A strong contender for your home should be the robust and refreshing Mira Vigour power shower. Delivering 14 litres of water per minute, this affordable option from Mira showers has everything you need for a healthy, clean start or finish to your day. It’s also safe for the family with its temperature stability feature. There is no contest when it comes to superior power showers. The Mira Event XS power shower delivers a super-soaking 16 litres of water per minute from its 9cm showerhead. 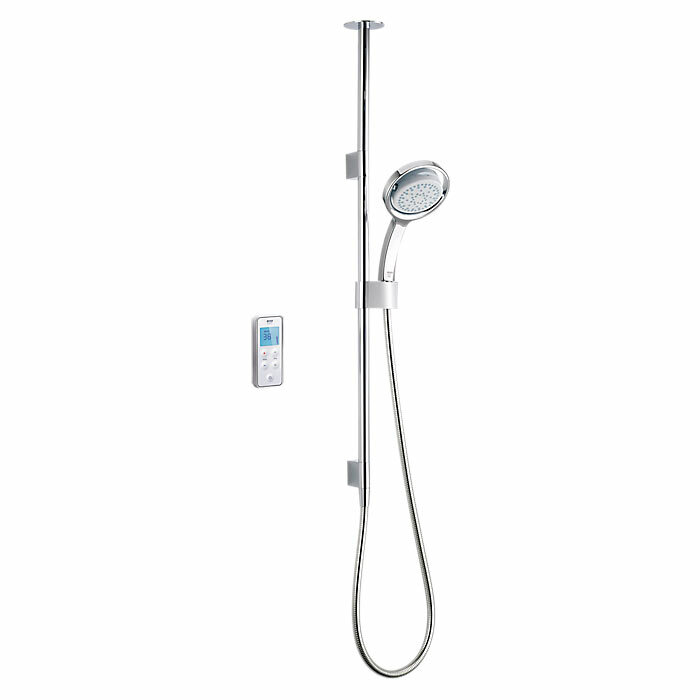 Loaded with luxury features this phenomenal Mira shower will certainly freshen up your day. We live in a digital world and everything we use nowadays seems to be either touchscreen or accessible by apps. If you’d have told us we’d be talking about digital showers 20 years ago you’d have probably been given a funny look, but here they are and they're actually surprisingly affordable. Digital showers work a lot like mixer showers in the way they take a hot and cold feed and combine the two for the perfect temperature. 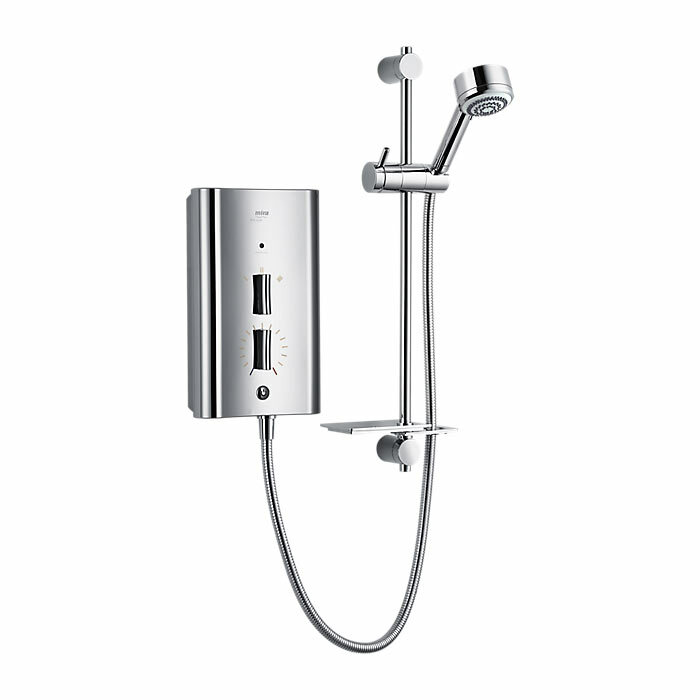 Mira have designed a stunning range of contemporary digital showers that will look great in any home. Take a look at this striking Mira digital shower. The Mira Vision digital shower range features a slider rail option as well as slider rail and ceiling fed combo for the ultimate experience. Each option comes with a remote control which allows you to set preferred programs for each individual as well as plenty of functions for a luxury experience; one worth a mention is the warm up program which prepares the shower to be ready for when you are. Finding something precious for your bathroom isn’t hard with Mira showers. The Mira Platinum digital shower range encompasses a stylish selection of single slider rail options as well as slider rail and ceiling fed combinations to ensure there is something for everyone. Precise temperatures can be controlled at the touch of a button and with Mira digital showers you can even control your shower from an app on your mobile phone. A mixer shower takes a hot and cold feed and mixes them together to create the optimal temperature for each individual user. 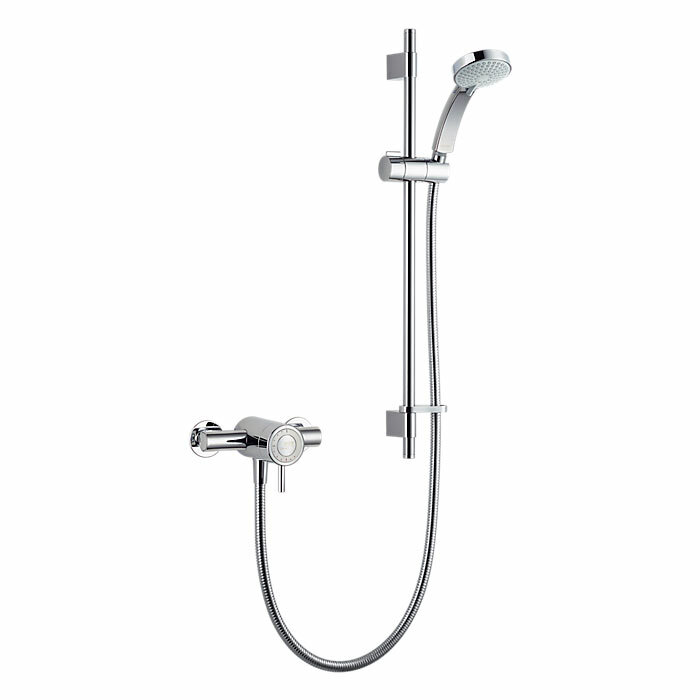 Some of the Mira mixer showers feature Mira’s Magni-flo technology which enhances the flow rate even at low pressures. Mixer showers from Mira come in a range of styles including Exposed Variable (EV) - which has controls mounted to the wall and connects to a shower head on a wall mounted slider rail via a hose, Built In Rigid (BIR) - which has the controls and shower built into the wall and Built In Variable (BIV) - which has a slider rail kit which connects to the controls which are built into the wall. If you like the sound of a simple mixer shower that does everything you need it to then the Mira Coda mixer shower is perfect for you. It’s in the budget range which means it won’t cost the earth and it’s a Mira shower so you know it’s built with quality in mind. Fully loaded with functions, it’ll give you an impressive shower experience with plenty of safety features for you and the family. Because your shower is an essential item in the bathroom, it really pays to have something that is built to high standards. Mira showers offer the Element mixer shower which features Magni-flo technology to increase the power and performance. This range also features a stunning design which makes it perfect for those who love style. The Mira Element range of mixer showers sits between the budget and mid-range price bracket making it appealing to anybody. 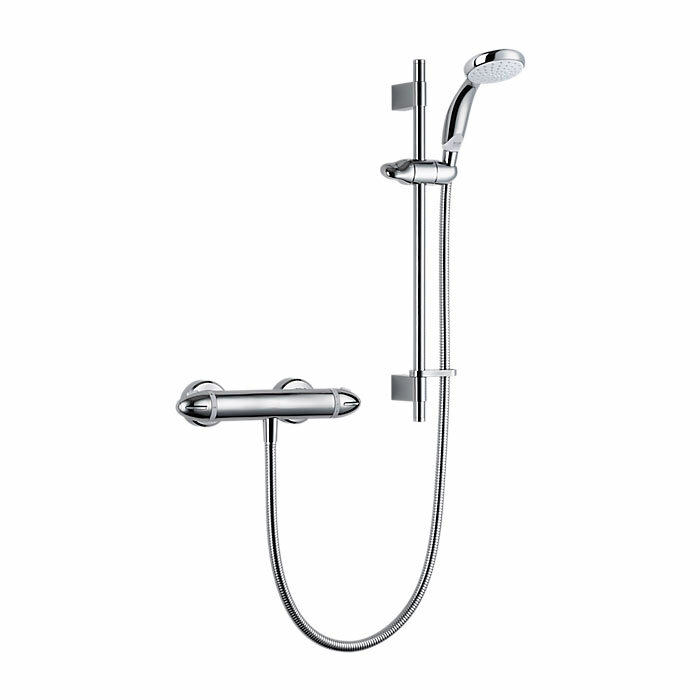 You’ll need to be quick on your feet if you want a Mira mixer shower from the Agile range. These beautifully designed mixer showers are easy on the eye yet packed with functionality, such as the ‘rub clean’ easy clean feature. The Mira Agile range is perfect for modern bathrooms and even has plug-in accessories that can be added from the Mira plug-ins range. Costs vary depending on the model but you’ll be pleased to know they span from low prices to high-end - ensuring there is Mira Agile shower for every budget. 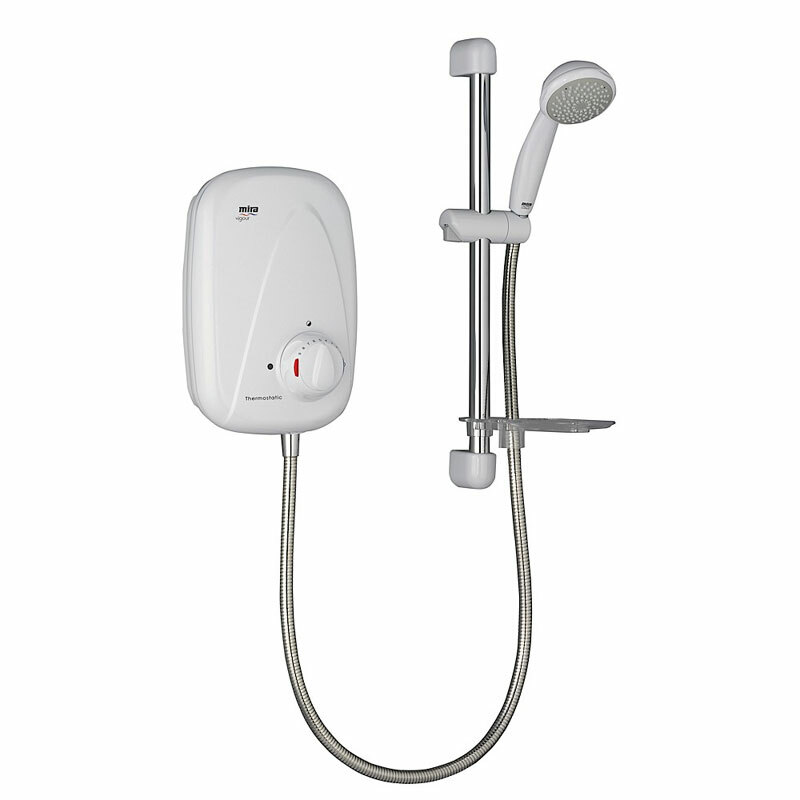 The Mira Minilite mixer shower range provides a compact option with all the essential functions. This means you get everything you need in a shower at a very affordable price. The Mira styling is contemporary and the build quality is exceptional as usual. It might be easy to think this shower can’t pack a punch, but with the Magni-flo technology it’ll certainly surprise you! 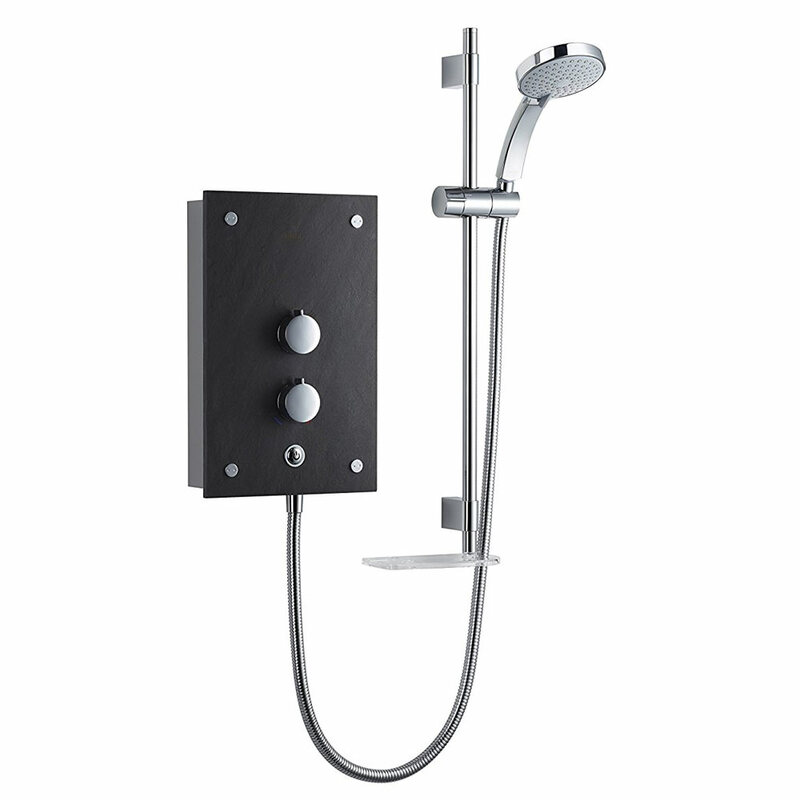 The experts at Mira showers have really excelled themselves with the Mira Adept range of thermostatic mixer showers. 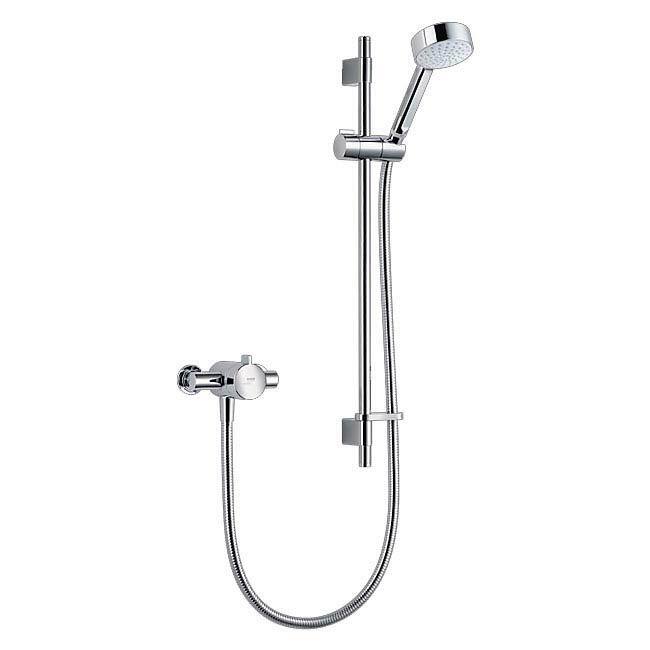 Sitting in the higher end price category, these modern stylish mixer showers boast a deluge shower head which is a large 250mm diameter over head piece that creates a rainfall effect, and a normal shower head that can be used together for the ultimate shower or easily switched between to use individually. 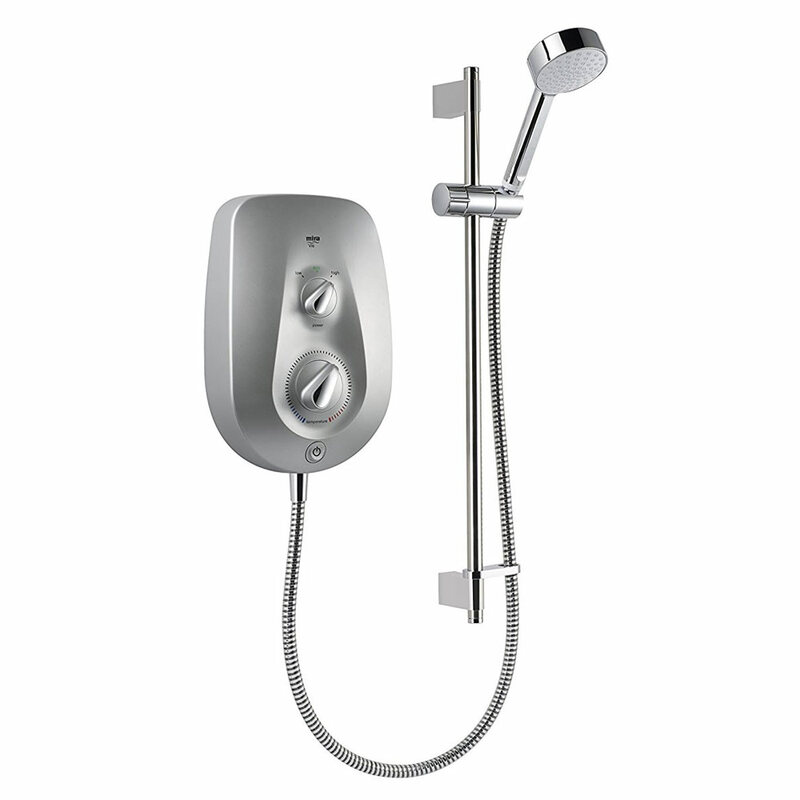 You can also opt for a version of the Mira Adept which doesn’t have the deluge shower head. This costs a lot less and still has all the other functions you’ll need. 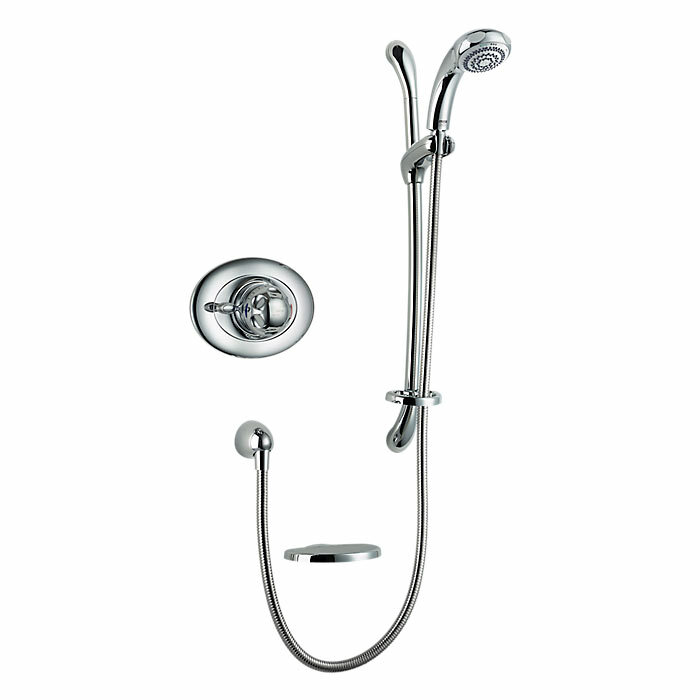 The king of traditional Mira showers may just be the Mira Realm mixer shower. Available with or without a large deluge shower head, these stunning rigid risers are perfect for achieving an authentic traditional look. 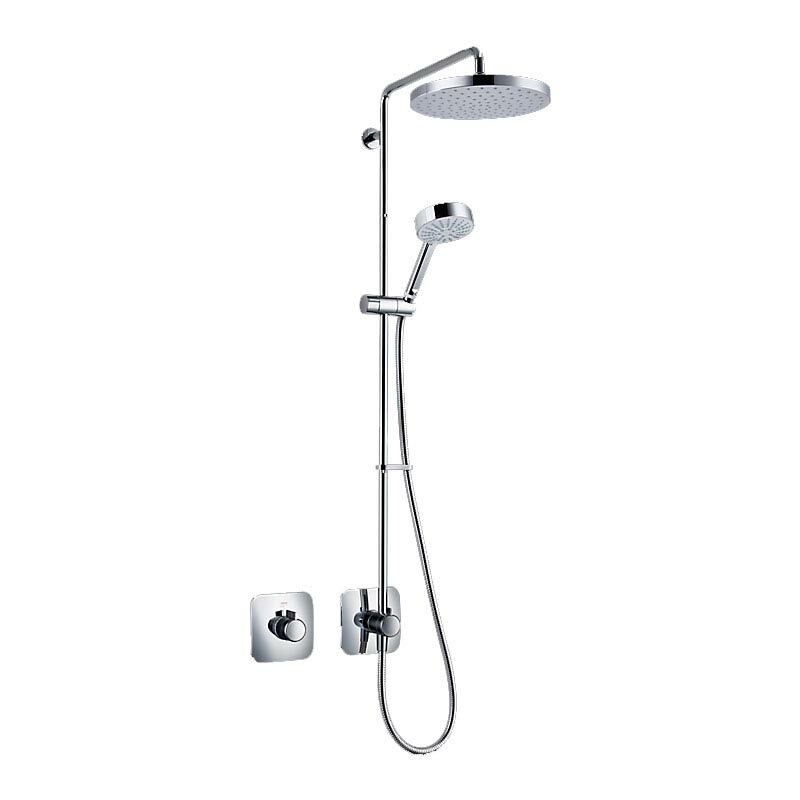 It’s a classic style, but it’s full of modern functions including thermostatic temperature stability which helps prevent the water getting too hot. It sits within the mid-high range of prices of Mira showers, but compared with other brands in this range it’s a great price! This small and stylish mixer shower from Mira comes in a choice of Exposed Variant and Built In Variant designs. Stacked with functionality, this compact Mira Miniduo mixer shower comes with everything you and your family need for a fantastic showering experience. It’s half the size of other mixer showers so it’s ideal for smaller bathrooms or spaces and it features magni-flo technology which means it can really deliver some power! It’s also very well priced meaning that it’ll suit any budget. For the best performance it’s hard to ignore the Mira Excel mixer shower. It’s loaded with clever functions helping it offer the ultimate shower experience, keep your family safe and work better for longer. 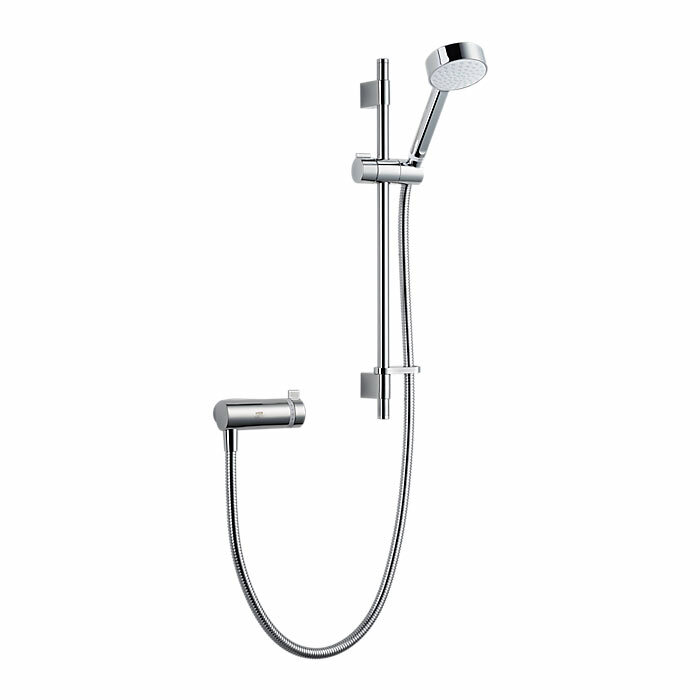 It sits in the high end price range for Mira showers, but it’s stylish chrome finish and luxury features certainly won’t put off any potential buyers. Professional installers recommend this product and it comes with a 5 year guarantee for peace of mind. 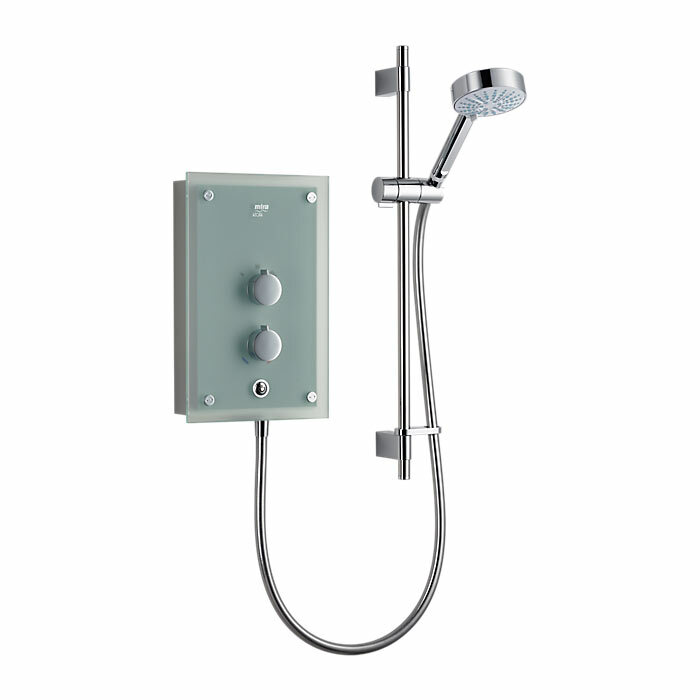 Last but certainly not least is the Mira Miniluxe mixer shower. It comes equipped with several intelligent features including Cool Shield; which prevents the valve from getting too hot during showering, Magni-flo technology; which increases the power by up to three times and rub clean nozzles; perfect for easy cleaning. 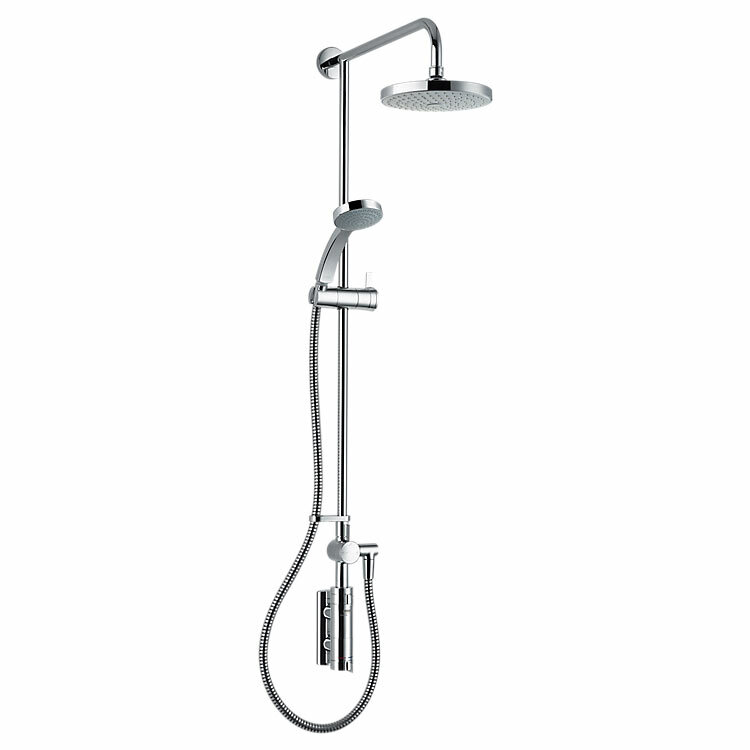 It’s fitted with a large deluge shower head which creates a luxurious rainfall effect. This family-friendly, stylish and contemporary Mira shower sits within a mid range budget, perfect for most homeowners looking for exceptional performance at a reasonable price. With all Mira showers, you know you’re getting the best quality and performance which will last for years to come. You simply cannot go wrong with a Mira, however by using our Mira Showers buying guide you’ll have a better idea about each model and be able to choose something that gets you the most for your money. 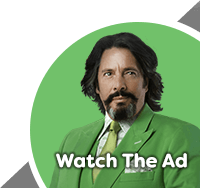 Whether you have a little or lot to spend, we’ve shown that there is something for everybody. Whether you’re looking for a shower that will keep your family safe or something that will look stunning in your new bathroom, a Mira shower is the perfect solution. 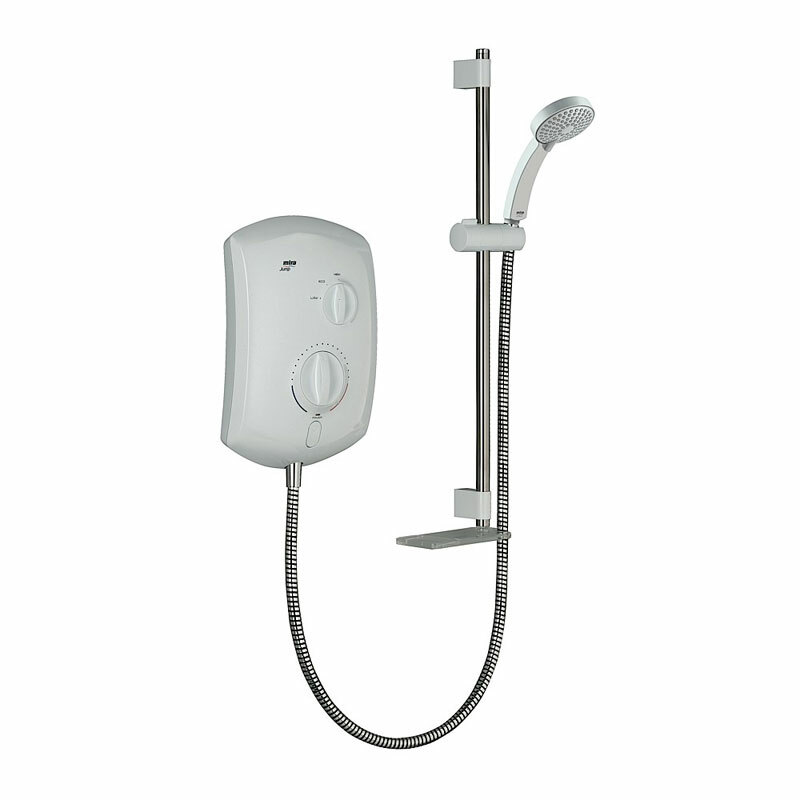 We hope you found this buying guide useful and if you know of somebody who is currently in the process of buying a shower please feel free to share this with them if you think they’ll be interested in a Mira shower.